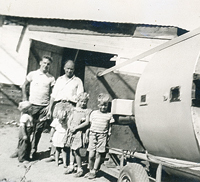 1951 -- Van Dam Dairy, Artesia, CA. Teo Albers, Sr. on right. 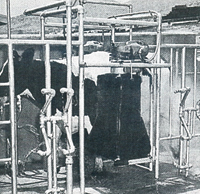 1954 -- Early automatic feed system for conventional milking barn. 1961 -- Albers cow soak and cow wash. The "Albers" family, having immigrated to California from the Netherlands, founded "Albers Mfg. Co., Inc.", in 1948. Since that time we have continued in the family tradition, proud of the fact that we have reached and surpassed 60 years of service to the dairy industry. Over those 60 years, we have provided and continue to provide innovative ideas that have made the dairyman's business more manageable and efficient. 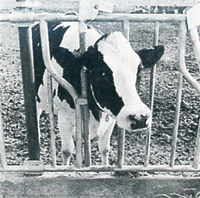 Most notable of our contributions is the recognition as being the "originator" of the self-locking stanchion. We are now in our third generation, and look forward to many more years of service to the industry. While primarily servicing the Western States for the first 40 years, the past 20 years has brought a large demand for our products in all dairy regions throughout the United States. Due to strong growth in the industry and increasing demand, ALBERS DAIRY EQUIPMENT has now opened branch-stocking offices in Idaho, New Mexico, Texas, Wisconsin, New York, and most recently, Rock Valley, Iowa. These offices are part of our continued commitment to better serve our expanding base of loyal customers nationwide. We also continue to ship internationally on a regular basis. We wish to thank all of our past, present, and future customers for their loyal support, and hope that we may be of service to you in the future. 1976 -- Introduction of self-locking headlocks.